Last month, Blockbuster announced that they would expand their High Definition disc rental services to 1,450 stores throughout the USA. 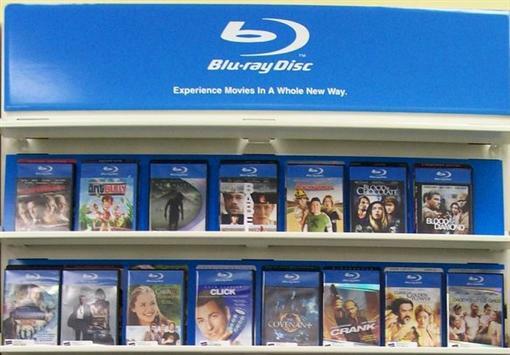 This in-store expansion would only include Blu-ray Disc titles, while HD DVD titles would still be carried online and at the original 250 high definition pilot stores. Approximately one month after the announcement, these Blu-ray titles are now showing up in stores. This Blu-ray only expansion into additional Blockbuster stores has been heralded as a significant win in the high def format battle, but the HD DVD camp didn’t seem very upset by the move. It is also worth noting that even though HD DVD titles are still carried online, the HD DVD service is less than desirable. If you would like to view more photos of the new Blu-ray displays and selection inside local Blockbuster stores, have a look at these photo albums: Store #1, Store #2. Thanks to mischa316 for providing these photos and links at DVDRentalForums.com. Personally, my closest Blockbuster store still does not carry high definition discs, although another store does, which is about 6 miles from my residence. Are the new Blu-ray titles showing up at your local Blockbuster and if so, how is the selection?